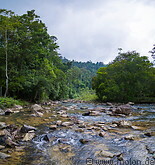 Together with Taman Negara, the Endau Rompin national park contains some of the world's oldest rainforests. The park is surrounded by a belt of palm oil plantations, but inside the park there is high quality primary rainforest, with majestic, tall trees. Near the Selai forest camp there are trails which lead to various waterfalls scattered along the Selai river. Due to the high humidity of the area (it rains almost every day), there are many leeches.